March 28, 2018 March 30, 2018 VAFHO - Victorian Association of Family History Organisations Inc.
Archive Digital Book Australasia, established in 2003, has digitised over 2000 old and rare books – approximately 2 million pages with approximately 140 million names. These are offered on individual CDs. 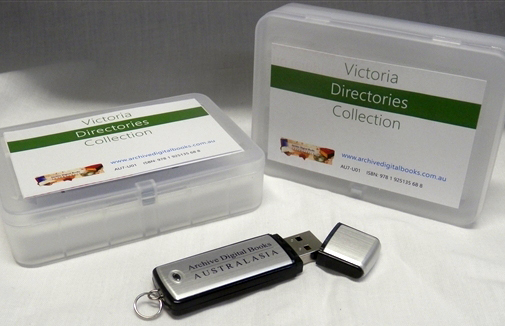 In 2014 we developed a range of 52 value special collections (our entire range) offered on high capacity USB drives at a fraction of the cost of buying the included products separately. Each collection is fully searchable. And now many of the books scanned are being offered as digital downloads through Genealogy ebooks. A further 40 smaller collections have recently been released. Check out our range of special collections beforehand at www.gould.com.au/usb-records – and come to the expo prepared with your order (or email it in advance so it can be collected at the expo). You could save hundreds of $$$.